Taking care of the environment is a big undertaking, but it doesnâ€™t have to be overwhelming. In addition to our programs and services, we offer a number of ways to help you get involved. Take the Treasuring Home Pledge or become an Associate Member to bring environmental stewardship home. Download free tips and instructions for great wildlife, water, and resource conservation projects in our Resources Section. Let us help you implement an environmental project, like recycling or switching to energy efficient lighting. Or make a company-wide commitment to environmental quality by developing an environmental management plan through our Audubon Cooperative Sanctuary Program. Take steps toward a more sustainable future using our Principles for Sustainable Resource Management as a guide. Or enroll in the Sustainable Communities Program and let us help your community establish priorities, develop a plan, and take action. 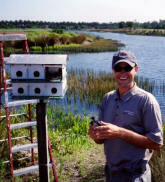 Mount and monitor nest boxes for birds through our Nest Box Network, participate in our annual North American Birdwatching Open, or become a Loon Ranger (NYS Adirondack Region only). Universities, governmental organizations, non-profit organizations, and businesses collaborate with Audubon International to share resources and achieve common goals. The Golf and Environment Initiative is dedicated to the game of golf and the protection and enhancement of our natural environment. Sign on as a Green Golfer, join our Conservation Country Club, or simply learn more.